I had now graduated college, had a job, and was living on my own. I was still playing games, but over the years I had sold and traded a lot of them. I decided I didn’t need to keep so much of my childhood and started cleaning out things to sell on eBay. He-Man toys. G.I. Joe toys. Ghostbusters toys. X-Men toys. And the video games. I didn’t sell everything, but I did sell most of what I had. I kept my consoles and my SNES and N64 boxed games such as Final Fantasy 3, Breath of Fire, Chrono Trigger, Secret of Mana, Star Fox 64, and more, but most of the rest went. The most painful probably is Bucky O’Hare, which has really gone up since I sold it and will be painful to replace. Included in the selling was my Playstation 2 once I got the first release, backwards compatible, Playstation 3. I didn’t intend to buy it, but it was time for a new TV and when I was getting that from Best Buy, a 3 year no interest plan made the TV, an HD DVD player, a Playstation 3, and a fancy surge protector a good combo deal. The first game I remember playing was Lair, which looked like it would be a mix of Star Fox and Panzer Dragoon. Sadly, it wasn’t very good, though there was some potential there. I played the first Assassin’s Creed game not too long after it came out and found it interesting, but very repetitive after a while. I also found it hard to pull off the full stealth for assassination missions. My Altair wound up being more of a warrior than an assassin. Yeah, that’s about how I wound up most of the time. The sequel, however, made huge improvements to the first’s foundation and was absolutely better in every category one could ask to be improved. Brotherhood built on some of the sequel’s features while Revelations seemed to scale back just a bit, but provided a satisfying conclusion to Ezio’s story arc. The third numbered entry wasn’t as well received by some, but I still liked it, especially the sailing portions (which was then expanded for a larger focus in both Rogue and Black Flag). Of course I can’t write this entry without talking about Batman. Arkham Asylum, Arkham City, and even Arkham Origins. 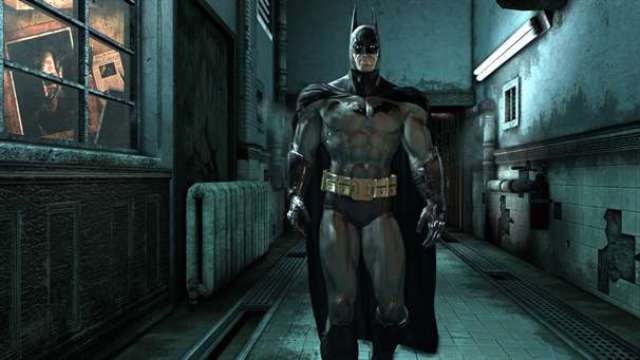 For the first time, Batman was fully realized in a video game with combat, gadgets, and even some detective work. I thought the end of Asylum was a bit weird with Hulk-Joker, but the story and experience was outstanding. For me, Arkham City was even better with access to part of Gotham, a higher stake story, and the feeling of actually grappling and gliding from building to building. Most don’t care for Arkham Origins, but I still liked it as a prequel and was satisfied with it forming a “Joker trilogy” on the PS3. I would have been fine if Arkham Knight had focused entirely on other villains without Joker at all. Origins also made me really appreciate Troy Baker’s performance of Mark Hamill as the Joker. The best Batman scene from Hollywood felt like these games came to life. Another great game on PS3 was Ghostbusters, which stands as the true “third movie” for me. It should have been the general framework of the connective tissue between Ghostbusters II and the Sony reboot (which I still think should have been a continuation with the new team opening a franchise or taking over the original location after the Stantz & Co. retired). A friend and I got to see a preview of the game before release at a local anime convention. The Terminal Reality dev team at the panel recognized our functioning replicas of Crow and Servo from Mystery Science Theater 3000 and invited us to come to the front of the room and take the mics to riff on their gameplay trailer. That was certainly a lot of fun and they seemed to get a kick out of it, even using a few of our joke comments to bring up gameplay points. Made them ourselves and I still have the two bots. I played the God of War Games on PS3 rather than PS2 and while the games were fun to play, I never really liked Kratos. He was just too much of an idiot for my tastes and I didn’t like the story direction being repeatedly “trick Kratos to kill things because he’s an angry moron.” Another series I didn’t like the direction of during this console generation was Resident Evil, but I played through 5 and 6 with a friend on co-op. They were fun gameplay wise, but the story and events just got too over the top ridiculous. There were a lot of good games on PS3 I missed due to work and money, but the biggest factor was probably that I was still playing World of Warcraft and one other PS3 game: Rockband. My friends and I played this game a lot and it was the go-to party game any time we had a group of people over. I don’t know how much I spent on DLC songs and packs, but I’m sure it was no small amount. Once Rockband was out, the only offering Guitar Hero had that got our attention was Guitar Hero: Metallica. Bonus note: Playing drums on expert can give you a decent cardio workout after a while. Towards the end of PS3’s life, Square & Crystal Dynamics released Tomb Raider, a reboot of the franchise that started with Lara’s first adventure for a mystical artifact that became a fight for survival. I enjoyed the game immensely, though I did feel it was a bit light on puzzle filled tombs the early games seem to be most fondly remembered for. It also lacked dual wielding pistols against dinosaurs, but one thing at a time, I suppose. I did like the silent attacks of the bow and arrow, though. If I can utilize a ninja playstyle, I will play like a ninja. 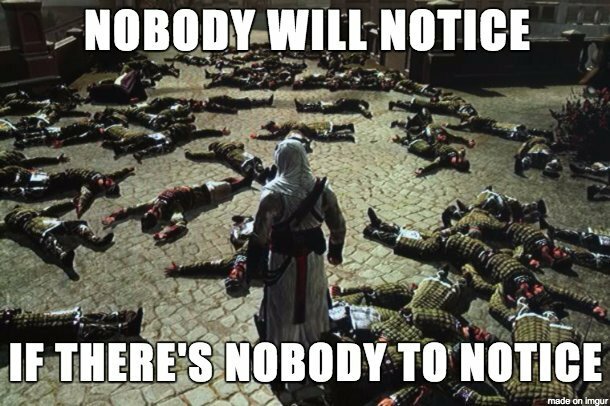 Except as Altair, apparently. Of course, Lara’s reboot owed much to her previous imitator and PS3’s breakout star: Nathan Drake with the Uncharted trilogy. My friend recommended the first to me when the second was announced, I think. I played the first and jumped on the other two as they released. Honestly, the games are so good, I’d rather see them become a film franchise more than see them continue milking the Indiana Jones films. Uncharted could definitely be the Indy of a new generation. The one thing Uncharted definitely has that I feel is sorely lacking in Indiana Jones and Tomb Raider is Victor “Sully” Sullivan. I love that character. Hideo Kojima brought the Metal Gear Solid storyline to a close with Metal Gear Solid 4: Guns of the Patriots (not that the series ended, of course, but further titles were prequels in terms of timeline). Thus, MGS4 was the canonical conclusion to both Big Boss and Snake’s stories. And it was a hell of an ending. I’ve felt satisfied with game endings before, but this is the only game that truly put a lump in my throat and a sting in my eye. I didn’t cry, but yeah, my eyes got a little teary eyed. Otacon’s struggle to explain to Sunny Snake had something to take care of, knowing he had left to commit suicide was hard. Seeing Snake almost do it was uncomfortable. Then seeing the talk between Big Boss and Snake before Big Boss said his final goodbyes was rather poignant. I was glad to see Kojima give Snake an ending of peace for the last few years of his life. The most stand out memorable experience for me on PS3, though, was definitely Dragon Age: Origins. I have still not played through the Knights of the Old Republic games, so this was really my first Bioware RPG since Neverwinter Nights. I played through as a female Daelish rogue archer the first time, focused on saving the world more than the personal relationships and side quests. I remember finishing the game around midnight or 1AM and after the credits finished, I made a male Daelish rogue and started anew, intending to go with the two-sword duelist instead. 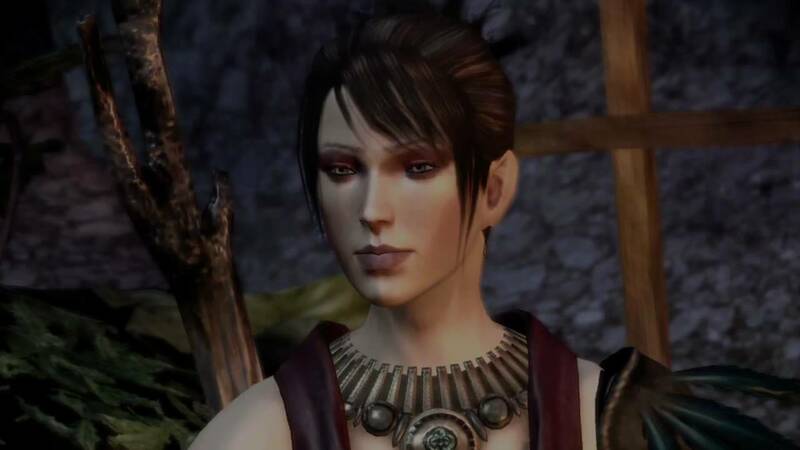 In this play through, I got to know Morrigan better, who I already liked for her snarky attitude despite refusing her offer at the end on my first playthrough. This time, I not only pursued more about her, but wound up romancing her and loved the change in her character as you get past the facade she wears. To see the uncertain and even fragile side of this badass character was interesting to me. I poured hours into my second play through, exploring everything and playing out my choices with more thought. I did all the DLC available at launch, exploring the Wardens’ Keep and recruiting Shale (who I loved as a character as well). Accepting Morrigan’s offer since she had gained my trust as a companion, I transferred my Warden over to the Awakening expansion. I liked Anders alright, but really wish Oghren had shown up in later games. With that expansion complete, I waited for the final DLC: Witch Hunt. My Warden pursued Morrigan and had a rather touching final conversation before following her into the portal to raise their child together. I did like how the Warden of Origins is discussed by Morrigan in Inquisition if you romanced her and went through the portal with little comments about how unbearable he’ll be for her asking for help and what she details the Warden is up to during Inquisition. I wouldn’t quite say she’s quite waifu level, but I really loved the character. In contrast, I was very disappointed in Dragon Age 2, as many were. I liked the idea of a single, sprawling city location and a long period of time covered, but the game was nothing like Origins. The combat seemed like a straight hack & slash with enemy respawns just falling from the sky half the time. I felt little need to use strategy or even give the party commands. Also disappointing was the lack of political intrigue. I expected a lot of political maneuvering as the Champion of Kirkwall moved up in standing as a known figure with your choices impacting the city and who would ally and support you versus oppose you. Instead the trial of Loghain offered more than all of Dragon Age 2. What was more frustrating was the lack of choices having any illusion of impact. I think this was largely due to letters telling you of any effect shortly after those decisions were made rather than being held until the end of the game as well as the fact that there simply wasn’t much to alter. Even setting the Anders conclusion aside, the quest disappointed me. I agreed to help him and once we had gathered everything, it felt more like the developers forgot about it more than anything. I never saw the ritual he claimed he would perform attempted. I expected him to at least put on a theatrical ritual to give the appearance of doing what he claimed to have planned. Instead he just seems to say he’ll get around to it later and never mentions it again until the one-conclusion Anders ending came along. Even all of this might have worked had the game carried an overarching theme of destiny/fate vs free will and questioned if the Champion’s efforts could have ever altered the future Flemeth and Morrigan had foreseen. I also felt like the game suffered by being “Dragon Age 2” and then not seeming at all like Origins. I think I would have tempered my expectations if they had said up front it was a different style and different approach and called is something like Dragon Age: Kirkwall Chronicles or Dragon Age: Hawke of Kirkwall or something of the sort rather than a numbered sequel. One game that came at the end of PS3’s life and was considered a crowning achievement that I really enjoyed was The Last of Us. I’m not sure if there’s really much that needs to be said about the game. The story was well done and the characters developed quite well. As far as gameplay goes, it was a pretty fun blend of survival horror, third person shooter, and stealth depending on how well you managed various scenarios. I felt remiss not mentioning it once I realized I had excluded it, so felt it was at least worth editing and adding a note on this title. That wraps up my most memorable games for the Playstation 3 and the transition of Growing Up Gaming to Grown Up Gaming. I didn’t have a Wii nor any X-Box consoles during this time either. However, I would soon turn my eyes back to the past once I began the hobby of retro game collecting, which I’ll discuss next time. Great post. The PS3 really had some memorable gaming moments, but I think I’ll always be grateful for it being the generation we got the Uncharted series.